How do I set the initial value for an "id" column in a MySQL table that start from 1001? Without specifying the initial value for the id column. 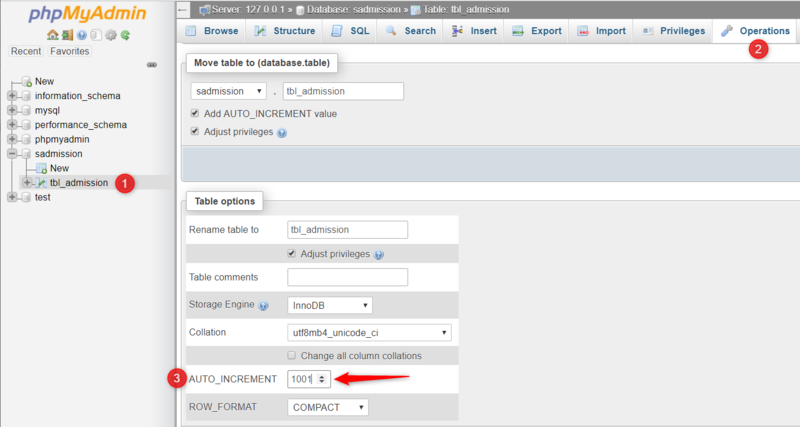 If you want to avoid writing sql, you can also do it in MySQL Workbench by right clicking on the table, choose "Alter Table ..." in the menu. When the table structure view opens, go to tab "Options" (on the lower bottom of the view), and set "Auto Increment" field to the value of the next autoincrement number. Don't forget to hit "Apply" when you are done with all changes. If you are using phpMyAdmin, you can click on the table in the lefthand navigation, go to the tab "Operations" and under Table Options change the AUTO_INCREMENT value and click OK.
Also , in PHPMyAdmin , you can select table from left side(list of tables) then do this by going there. Now, Set your values and then press Go under the Table Options Box. You could also set it in the create table statement. Alternatively, or you are lazy to write SQL query. Then this solution is just for you. Not the answer you're looking for? Browse other questions tagged mysql insert auto-increment or ask your own question. I want to set the initial value to a primary key which is also set to the auto increment option such as it begins from the value 7899 in mysql? mysql: how do i start auto increment from a specific point? What happens when an auto-incrementing column runs out? Change auto increment starting number?